The group putting together the Eureka Montana Quilt Show is stellar. So many details to manage and yet they seem to enjoy it all. And this year they have thrown themselves into it months before the actual show (August 2), so they have enough time to think up new elements. For instance, there is an apron contest. As the Quilt Cops who oversee the quilts hanging all over Eureka during the show need aprons to keep various things in, the EMQS committee decided to have a contest to acquire new aprons for these volunteers. And who better to help with this than Simply Josephine, who is surely the queen of beautiful aprons? You can get directions for making your apron and read the rules for the contest here. Should be a fun project to ponder and just think about the results – all those Quilt Cops sporting lovely and original aprons! 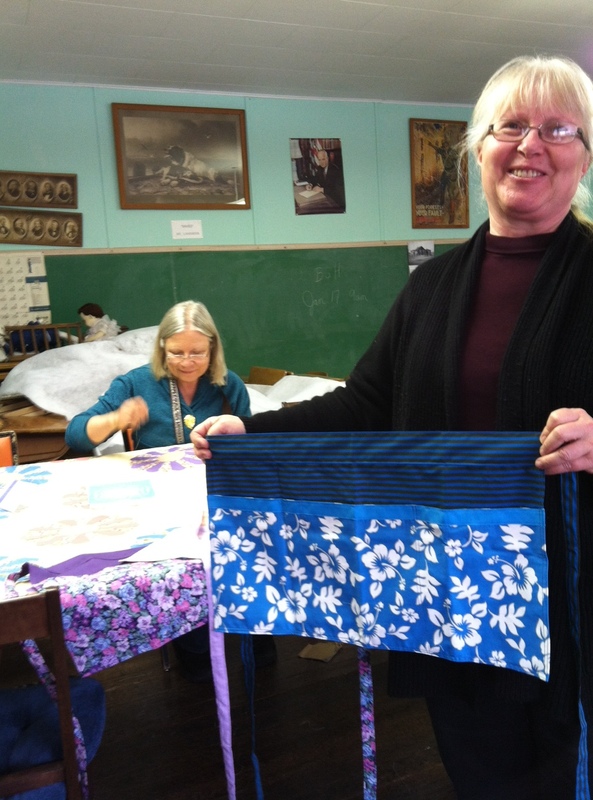 Last week at our Friday quilting, Sally showed up with at least a half dozen aprons she had already made. She is another one of those Wonder Women who gets more done in a day than I manage in a week. She did a show and tell so that we could admire all the different fabrics she had used. Here is a photo of her showing us one. It was hard to decide which was my favorite as they were all appealing. Two things came to mind as she showed us the aprons she had made. The first was a cafe that used to be in Powell’s Bookstore in Portland. The cafe is still there but under different ownership. During the time I am thinking of, the owner had decorated the walls with all sorts of vintage aprons. Sitting in that cafe, I was struck by the idea and the visuals. Aprons which seem so utilitarian gracing the walls and looking delicate and sprightly. There is the main part of the apron and then the strings. In the cafe, the apron strings reached out and intertwined with each other on the walls. And that brings up the second thought…the saying about being tied to someone’s apron strings which implies unhealthy control by another. And that other is usually a woman because that is who aprons are associated with. Have you ever heard someone say, “she’s tied to her father’s apron strings”? Another one of those gender stereotypes we can so easily fall into. But I am not going farther down the path of stereotypes and language today – at least not on this blog. Sally’s aprons are lovely and the contest is an awesome idea. The aprons (and their strings) will be a delight to behold on August 2. Maybe I should start designing mine this weekend.